The second main feature (the first being the new Graphical Control Panel) is what the visitors of all ages at the show liked the most: mini dance games played to live DJ mix. The live sound is sampled for beat detection either via audio in cable (from the DJ’s laptop/mixer), or directly from the sound card if the music is played on the same laptop that runs Visikord, e.g. when using VirtualDJ. The games are more than just games however: their main purpose is still to provide a visual show for everyone looking at the screen, which is why they are “Visual Effects rhythm dance games.” The end result is the guests do the work of synthesizing video for music visualization while doing a simple fun task (or not so simple if you decide to amp up the difficulty — though still fun, if not more so). The game is to catch falling stars that are pulsing on the beat. When hit on the beat, the stars produce explosive video effects, and there are other celestial objects, loosely speaking, that do different things when hit timely (change backgrounds/videos/hand effects/dancer skins/outline etc.). There is a simple score on a hit, no penalty on the miss, and it can be played in pairs. This is the perfect game for a situation when there is a lot of people in front of the camera who all want to dance. Credit for the star-catching idea again goes to Ade North; we are fortunate to be working with people who are not only technical but have a great imagination and feel for what the audience likes. The video below shows some younger audience at the show exercising their movements; you can see how boys and girls play the game differently. Also interesting is that after getting enough practice with the stars, they were more confident in playing “freestyle” mode. The game can also be played in pairs as shown in the segment of the front page video. 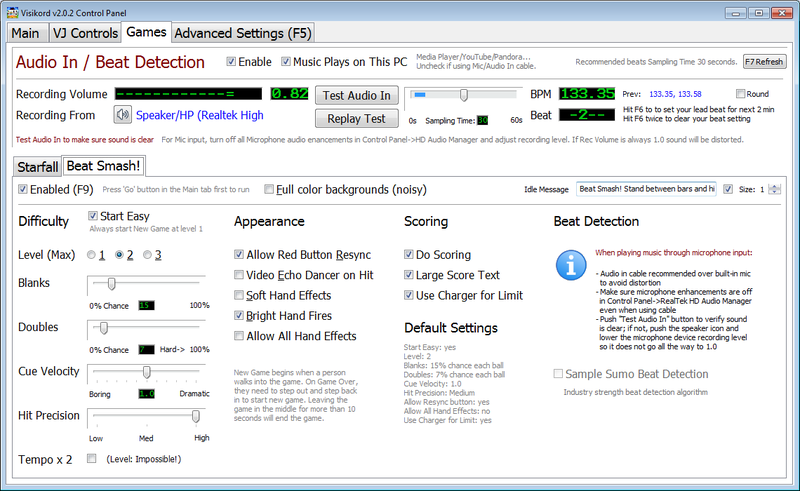 Beat detection is performed in real time, from external sound source or from the sound card. 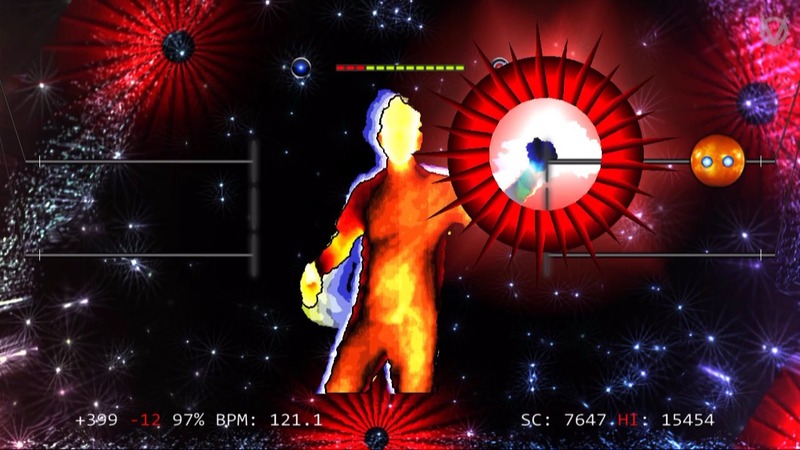 For this game it is optional; the DJ can chose not to enable beat detection, leaving only falling stars that can be hit at any time to create effects. 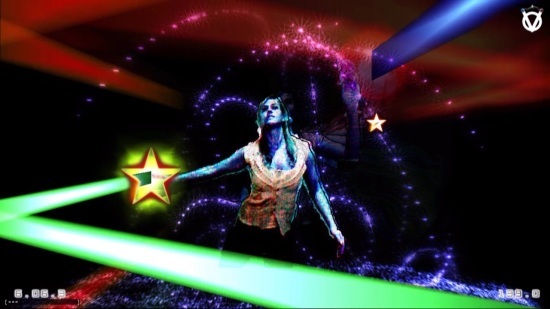 The other thing the DJ/VJ can do is control the difficulty — falling speed, “wind”, places where the stars come from etc. — to increase the challenge, or send a bonus “Smiley DJ” icon the dancers’ way that shows a custom message if/when they hit it (e.g. “Happy bday Susan!”). 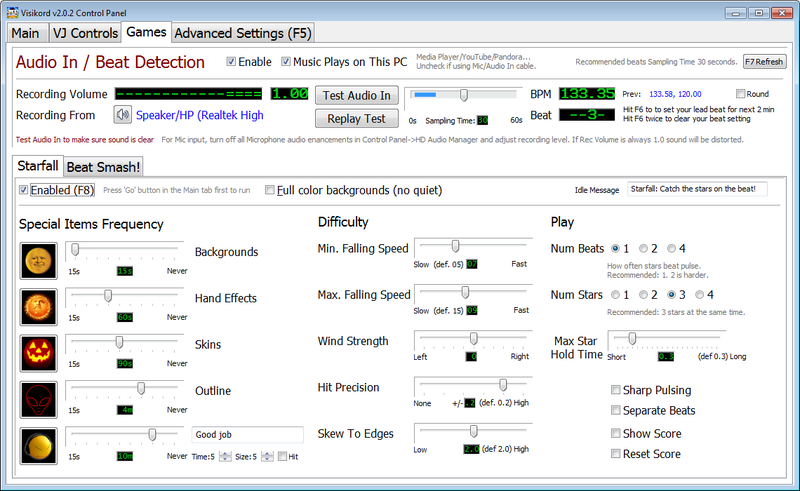 You can see the audio in/beat detect and the game control features in the GUI panel screenshot above. All Visikord video synthesis features (effects, videos, backgrounds) etc. 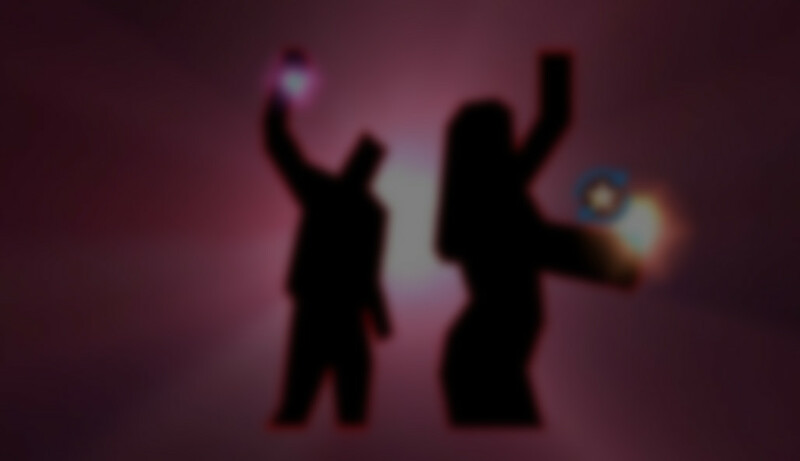 are available in the game mode as well, with the added advantage that dancers can make less “visual noise” — stars “explode” and graphics change only when the objects are hit on the beat. The Stars game is activated by clicking on its tab or pressing F9, and there are plenty of tweaks available via the control panel to users who like hands-on control. The second game is much more of a game — it has new game, score, penalties for misses leading to game over (all optional) — but it is seamlessly integrated in the party flow: when there are no people right in front of the camera, it acts as an automatic music visualizer. The moment someone takes the center spot, a new game begins. Please take a look at this informal demo video to see how the game is played. It is made to act as a bit of a challenge, so the second and the last third are played at high difficulty. Without people playing, Beat Smash! runs in demo mode, visualizing the music by munching the beats on its own and showing instructions what to do. Once someone enters the scene and starts playing, Beat Smash! is a game and a music visualizer — and guaranteed to be on the beat because the effects fire only when the beats are hit, well, on the beat. 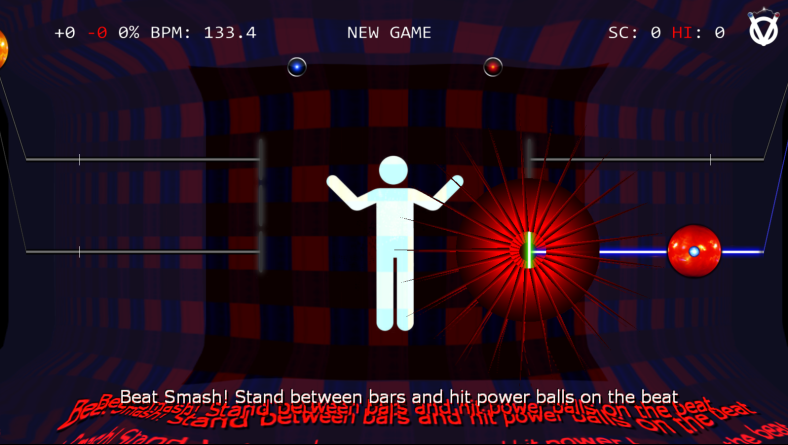 Hitting the beat increases the score (level-based), and missing a beat reduces the energy charge, and when it drops to zero it is game over. Game over still lets the player continue playing and visualizing music, they just won’t get any points for it. The operator activates the game simply by clicking on its tab or pressing F9. By default it runs on automatic progression — starting easy, then increasing in difficulty if the player is doing their job well — so no further action is needed. Visikord being software for parties however, it still allows for fine control of how the game and the visuals behave via the new GUI Control Panel. All the new features are in the latest release which we’ll start rolling out to customers in a few days. If you haven’t received your update please send us an email at any time and we’ll send you the update right away. Thank you and we hope you and your guests enjoy the new stuff!